I do remember something similar happened some time ago and I was hoping someone else could answer, I'm afraid I don't remember if there was a solution. I don't have my computer right now and I don't remember what is the last Nvidia version, but I think you could update your graphic drivers. It could be useful if you shared also other data by capturing screenshots with GUI next time so everybody can visit the same coordinates in space and time, in order to check eventually driver related issues. Very good idea. I will make another screen shot later today. I will also look into a new or different graphics driver. In the meantime can anyone else help me with this transparent mountain/terrain issue? Second, I have two (possible) bugs that I want to report here. 1) I went to look at some white dwarfs, neutron stars, and black holes. While black holes are rendering very well, neutron stars and white dwarfs appear as solid white disks for me. Attached screen is a neutron star. 2) I cannot seem to find any neutron stars or black holes with accretion disks. I tried a 1000-ly search area for those with "rings" and while I found a handful that matched the filter, no accretion disk was visible, and the Editor blanks out those fields (implying they are generated with accretionDisk "false" or whatever the exact tag is). Attached is my SE.log, which has shown no errors that I can spot. Not the greatest system any more, I'll admit, but so far it's been pretty solid for SE. Try Sagittarius A. A black hole in the center of Milky Way. That one has accretion disk. Indeed, I do find an accretion disk around Sgr A*--but not around any procedurally generated objects as far as I can find. Even if the Star Browser claims a match, it isn't actually. I'm also having difficulty figuring out how to use the /addons/ folder. I've tried just about everything from putting my .scs directly therein to (as the download page suggests) putting all the .scs for a custom system into one big .pak (.zip) with no further folder structure. Admittedly I have not tried =editing= said .scs yet to accommodate some of the new features, but I would expect to see errors coming up in se.log. Instead, SE seems to ignore the .pak file (or files) in /addons/ and goes on its merry way loading all the default catalogs. This folders you must create if they do not exist. In the folders 'addons\catalogs\planets' belong the scripts with planets, asteroids, comets, and so on. And stars that belong to a 'StarBarycenter'. For example, double stars like Alpha Centauri A and Alpha Centauri B. The .pak files usually go in the folder 'addons'. But only if they contain the correct folder structure. So for example 'catalogs\planets' and 'catalogs\stars'. If there is no 'catalogs' folders in the .pak file, but only the folders 'planets' and 'stars', then the .pak file must in the 'addons\catalogs' folder. You can make subfolders for each star system! But in these subfolders must again be the same folder structure! I was about to post "pleased to report that everything seems to work fine for Intel HD Graphics 4000 on Windows 10..." but alas! While double-checking I did indeed find a problem. I have yet to pin it down exactly, but it seems as if something in star surface loading and rendering is causing CTDs. ...and when I tried to go in close to the star SpaceEngine either crashed entirely or did an odd thing wherein the entire screen turned black, but based on what I could hear the menus, panning the camera, and presumably all the other controls worked fine (I of course ended up having to quit anyway since I couldn't see anything). At first I thought it might have to do with auroras or whatnot, since those have bugged me in the past, so I tried turning off auroras, comet trails, water, and even clouds and atmospheres. No luck. I noted the addition of procedural carbon stars in this version, so I investigated whether those were the problem by visiting a variety of different stars and zooming in on them. I tried a few random white dwarfs and had nothing bad happen (although I did notice that they still had plain white surfaces and no gravitational lensing, disappointingly); then some red dwarfs and still nothing; then I visited carbon star HIP 90709/HD 170495 and experienced the problem again. When far from the star, everything appears nominal, but when approaching it, even slowly, SE either goes all black or crashes. If it goes black, I can drag the camera to look away from the star, then restart SE and be able to play again; but if it crashes, predictably, I just have to keep restarting until it doesn't or turn off stars so I can escape to another system. - The distance at which the crash occurs seems to roughly coincide with when the star changes from a point sprite to a 3D model; in the case of HIP 90709/HD 170495 this happens at about 4550 AU. - Changing the loader mode between immediate, interleaved, and asynchronous seems to have no effect. - Changing "PreloadDrawShaders" to 1 also seems to have no effect. - I read something about an old bug with sprite rendering on Intel GPUs, so I tried changing the point sources style to "points;" still no dice. 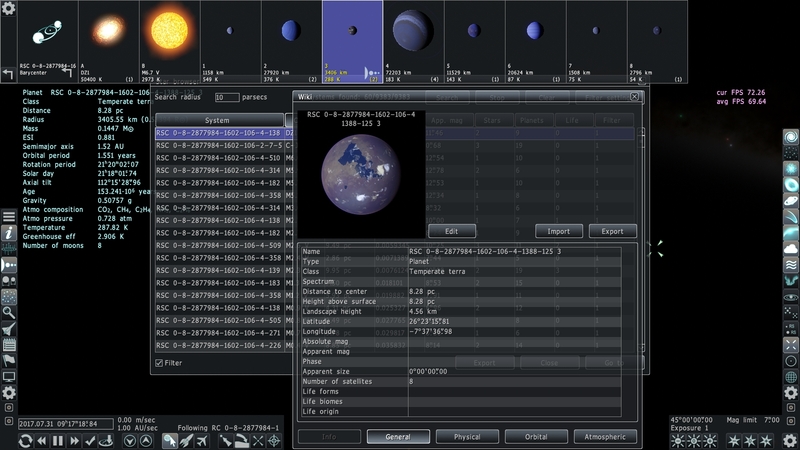 - On occasion, particularly when a system has more than 9 planets, the screen will go all black for a few frames when pulling up the F2 chart, but in this case it seems to recover fine on its own. EDIT: Okay this is getting weird now. 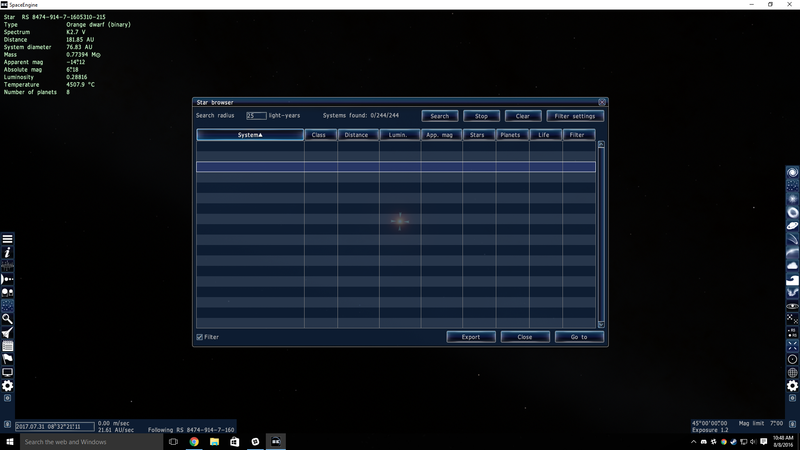 I tried going to Proxima Centauri and orbiting around the system using the right mouse button. At certain distances and angles, the screen goes all black, but returns if I orbit or zoom in or out enough to leave the "bug zone." Waiting for a few seconds does not appear to have an effect. 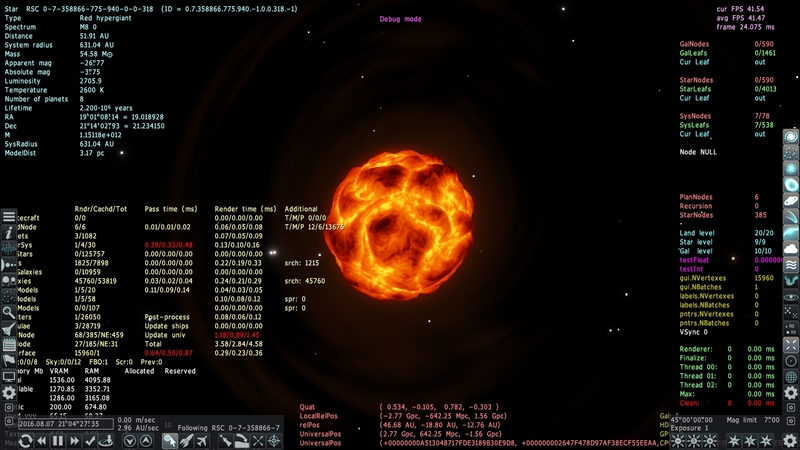 I suspect the "bug zones" are related to areas where certain stars in the system are or not rendering as 3D models. EDIT EDIT: Wow, derp. All this time I'd thought Proxima was part of the Alpha Centauri system. Apparently what I was looking at wasn't stars at all but procedural planets around the star. I'm so lost! EDIT EDIT EDIT: After moving this to the correct thread (herp derp) and combing through it, this seems to be the same issue affecting Ostarisk and Jonahrf, and possibly also PlutonianEmpire. I too did not experience this problem in any of the "RC" versions. Increasing my VideoMemorySize to 2048 appears to have helped for now. Nope! It helped with Alpha Cen and some other stars, but when I tried going back to that interesting binary I'd found, the problem came right back. I tried increasing the memory size even further to 3072, but to no avail. What could it be that's causing SE 0.9.8 to need all that extra memory that 0.9.7.4 didn't? Update: More information if it helps. 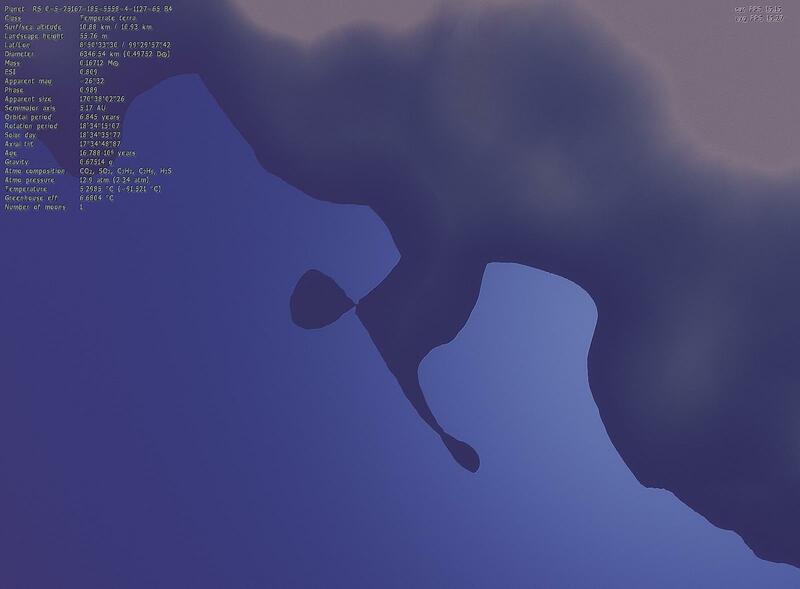 Below is a screenshot from Debug Mode. The star in question renders normally from this angle near the equator, but orbiting to look at it from either pole causes the screen to go all black. Going back to this angle restores it. 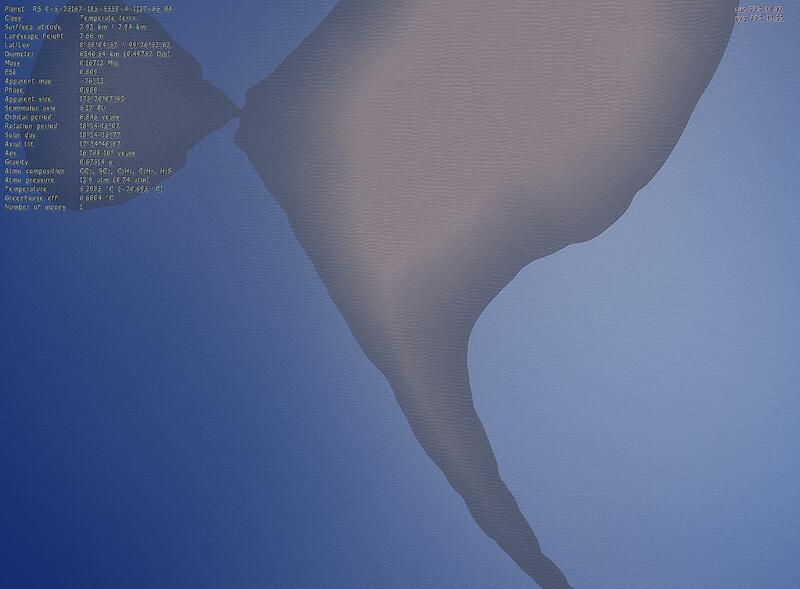 Another update (sorry for making this so long): I read through the entire changelog for 0.9.8.0 both on the Downloads page and at http://en.spaceengine.org/forum/21-3022-218#69881 and didn't see anything related to terrain or star loading or rendering, so I double-checked with 0.9.7.4 RC3. The red hypergiant I mentioned today did not exist, but the system mentioned above with the white dwarf did and everything worked perfectly. So I can say with confidence that the bug we're seeing was introduced in between 0.9.7.4 RC3 and 0.9.8.0. Also, I tried running SE with no catalogs to see if that would help by reducing the demand for video memory. No effect. I have a bug here with the star browser. When searching for stars, none of the text shows up, but the stars are definitely there as I can select them and go to them. Below is a link to the screenshot. And after some point in the star browser, it just crashes. I found a bug where texture is transparent to my moon yet uses procedural textures, I capture with and without atmospheres and my se.log. Edit : After opening Space Engine, transparent texture has disappeared to be replaced with the procedural texture, giving the normal appearance of my moon.